EPIC! 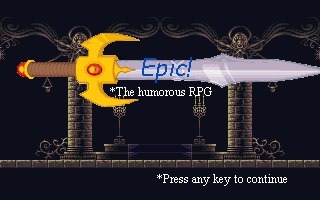 The Humorous RPG is a terrible parody RPG I made using the OHRRPGCE back in 2012. I made it available for download to showcase that we all need to start somewhere. Within it, the jokes are awkward or stupid, the graphics and music that I actually made tend to be ugly/grating, and worst of all the actual balancing in this is miserable. It's mostly a curiosity at this point.